Guest blogger Bob Reeves returns to write about strikers at the Idris lemonade factory and the use he made of the TUC Library Collections when doing his research (specifically the Gertrude Tuckwell Collection). See his Blog for more information. 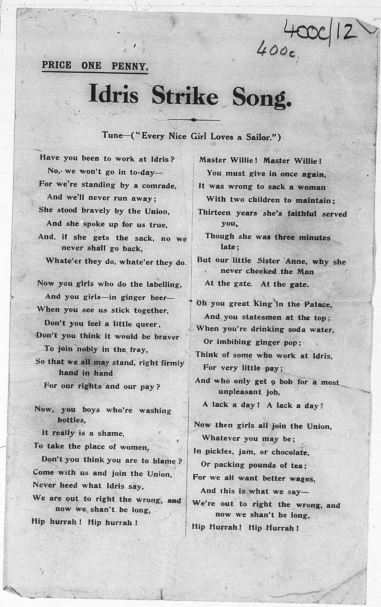 In April 1911 the strikers at the Idris lemonade factory were selling this song-sheet on the streets of Camden Town. They sung at every opportunity-picketing the factory gates, marching and collecting money to sustain themselves. Appearing very soon after they first walked out, no one woman claimed authorship. Then who claims authorship of football chants and anthems? They sung this to the tune of the then popular “Every Nice Girl Loves a Sailor” so it would have been immediately recognised in the streets. Here is just a very brief account- a background sketch – of the song and the strike. I’m currently working on more detail and, in this, the Gertrude Tuckwell collection at the TUC Library (source of this song-sheet) has been invaluable. What does the song tell us? Master Willie is William Idris, owner of the Idris lemonade factory. Little sister Anne is Annie Lowin, union activist in the factory, just sacked for lateness and, allegedly for abusing the time keeper – but she never cheeked the man at the gate. William Idris is quoted a few days into the strike as saying he would never re-employ that woman. Discontent at the factory had been simmering since the previous autumn. Annie Lowin, who was president of the local branch of the National Federation of Women Workers (NFWW), had achieved some basic improvements – women had complained that they were often up to their ankles in dirty water, so management had provided clogs. Under pressure Idris had provided an urn, instead of a bucket, so that they could make tea. But in recent months union activists had been harassed, so sacking Annie, a 24 years old widow with two children who had worked at the factory for 13 years – just do the sum, since she was 11 or 12 – was probably not a surprise. The walk-out in support of Annie seems to have been spontaneous. First it was her department, followed by the ginger beer workers. They picketed out some of the boys recruited to break the strike. Everything about the events of the next week or so was creative and even theatrical. The public was appealed to for sympathy and for funds. With the support of the NFWW and Mary MacArthur they rallied in Trafalgar Square. They worked hard on publicity, portraying a bullying male owner victimising a single mother with two children. They didn’t win. Not all the strikers were taken back after men and boys had been taken on as strike breakers; also, not all the women in the factory joined the strike. For Annie Lowin it was life changing. She wasn’t going to get her job back but the NFWW recruited her as a paid union organiser, and four months later she could be found helping the women on strike in Bermondsey. Now then girls all join the union.